Will the real Iris sintenisii PLEASE stand up! What could be simpler than identifying an iris species? After all, we are not talking about thousands of cultivars and there are plenty of good species descriptions. Right? There seem to be a number of impostors being called Iris sintenisii, but the real thing might be right under my nose. Years ago I purchased a plant (1) under this name, but it never looked right. Later I was given a different (2) I. sintenisii that fit photos better. 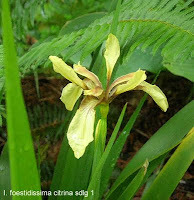 Then I acquired Iris brandzae (3) which all the literature agrees is a subspecies of I. sintenisii and is very distinctive. Here is where identifications really began to get confusing. If brandzae really is a subspecies (ssp) of sintenisii, they should both look something alike. My two other plants were quite different although obviously small spurias. I then grew a fourth small spuria (4) under the name I. kerneriana. I've grown this before and it is an attractive small plant with yellow flowers. When it bloomed it had violet purple flowers so was obviously another mis-named small spuria. That's 4 plants including the obvious I. brandzae. I wondered about this but never dug deeper into the species descriptions until this spring. All four iris bloomed and it was obvious some had the wrong name. After reading descriptions of all the smaller spuria species. 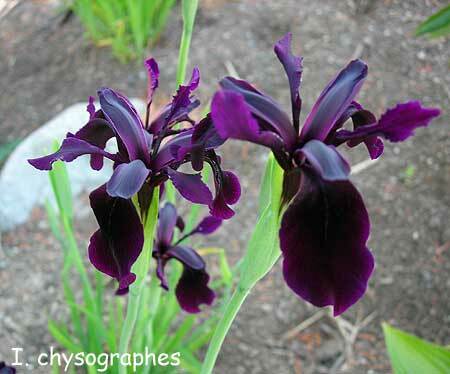 And starting with a fairly clear idea of the correct ID of I. brandzae I have begun to sort these four iris out. The plant grown as I. kerneriana (4) corresponds to a larger version of I. brandzae with similar flowers and overlapping bloom season. 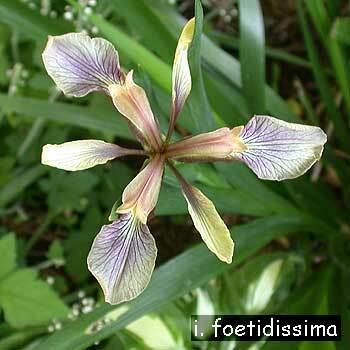 All species iris books concur with the description of what I have as I. sintenisii ssp brandzae. This makes plant #3 closest to what the true I. sintenisii should be. My original plant (1) has bloomed often enough that I am fairly certain that it is actually a short form of I. carthalinae. This leaves my second plant (2) that everyone else grows as I. sintenisii, but I now think has to be an imposter. So what is this one? Using the BIS Species Guide and Mathew's "Iris", I am leaning toward I. pontica, but having never seen or grown this species it is just a guess. I sent photos around to a few spuria iris gurus to confirm my suspicions, but everyone that replied guessed other name combinations and none saw my similarities. One guessed I. graminea which is very distinct from the other small spurias and I have grown for years with a firm understanding of the correct ID. Now if only I could identify the iris commonly grown as Iris sintenisii (2). I am hoping to get pictures and descriptions together for another round of 'Name That Iris". Until then will the real Iris sintenisii please stand up and be identified? Dry shade? There's an iris for that! No matter where you live or what your climate, there's probably an iris for you. Dry shade, however, is one of the hardest parts of the garden for which to find plants that thrive, let alone members of our favorite genus. Today I'd like to tell you of a member of the iris family that has done well for me in dry shade. 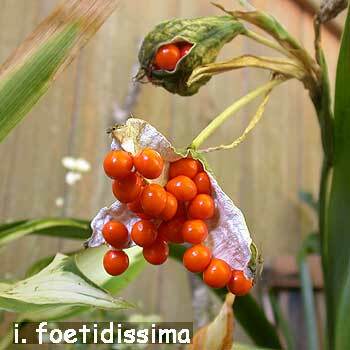 Please meet Iris foetidissima, classically known as the stinking iris, stinking gladwyn or roast beef plant. Don't worry, the flower itself does not have a bad odor. Rather, the name comes from the scent of the leaves when they are crushed, which to some smells 'beefy'. 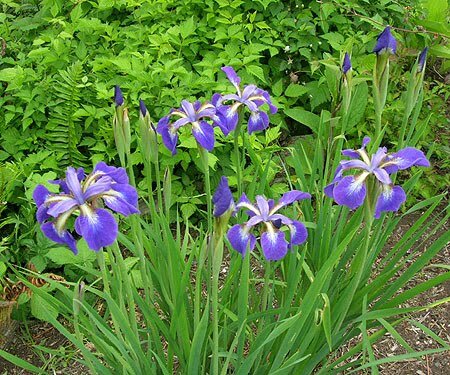 This interesting member of the iris genus is an evergreen perennial native to the west coast of Europe from England down thru Spain and across the water into north Africa. It likes mild winters and is not hardy above zone 6. I. foetidissima thrives in the dry shade at the margins of the tree line in my garden where it gets no summer water. It's rather drab blooms open in late spring, and are often overlooked. They are usually found in a muted lavender-buff, but yellow and white flowered versions are also available (sometimes listed as citrina, lutea or alba). The tall slender foliage is a deep emerald green and remains lovely all year long. There's even a variety with variegated white and green foliage, which greatly extends the garden value for the plant. While the blooms of this iris may not catch your eye in spring, it will certainly grab your attention come fall. I. foetidissima's big claim to fame is its seedpods which burst open to reveal a delicious splash of color. In contrast to the drab blooms the seeds are a bright tomato red. Versions with sunny yellow or bone white seeds can also be found. They light up in their shady bed all thru the autumn before falling in late winter. I've yet to see I. foetidissima for sale in the nursery trade, but they are very easy to grow from seed. If you'd like to try this wonderful variety check out the annual seed sale at the Species Iris Group of North America (SIGNA) where I have found offerings almost every year in a wide variety of colors. While collectors and connoisseurs will enjoy it just as it is, this is an iris that is wide open for the hybridizer, as only a very few improved varieties have been introduced. Cleaner colors and larger flowers are really needed before this one is going to be a hit with the general public. I. foetidissima will take part sun to full shade and is not at all picky about soil type. If you've got a tough spot give it a try. “Don’t judge a book by its cover”. An old saying that is appropriate today as it was when first attested in the journal 'American Speech' in 1952. 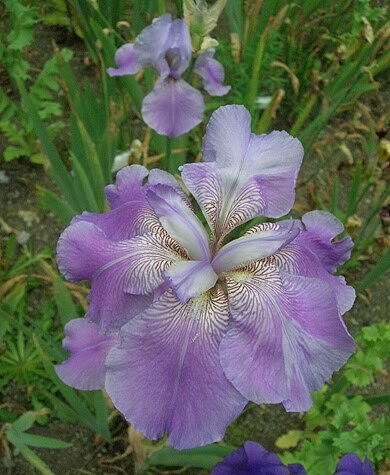 (1) Many of us purchase irises, especially new introduction, by a picture in a catalog and then are disappointed because is not exactly what the pictures looked like. 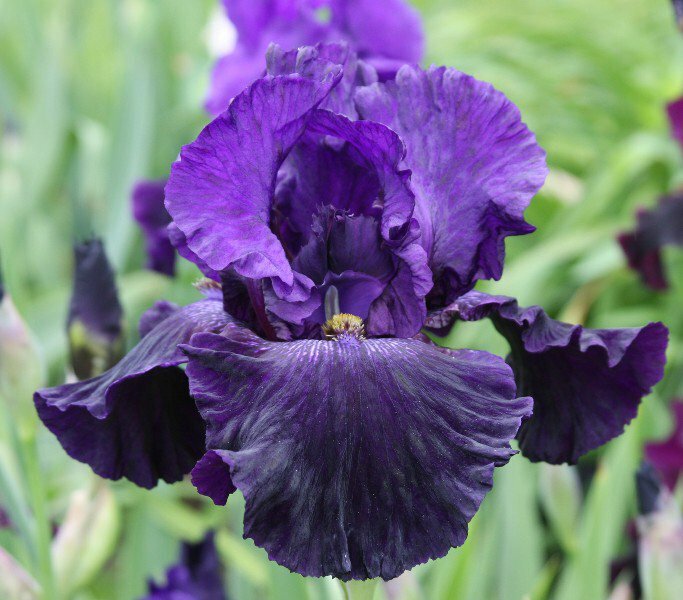 I hear complaints from many, especially those new to irises that a dark iris pictured in the catalog is only just another purple. Well, such is life and nature. Each of us, even those that live next door to each other, have different micro-climates and soil contents. The soil content is the greatest factor that we control with the addition of compost, lime, chemicals, fertilizers, and plant material. The color and form of an iris can also be affected by: how long since the rhizome was planted; the amount of weeds vying for nutrients; the age of the bed; the base material of the bed; the amount of rain fall; temperature; wind; and even more factors that many do not consider. An example of this can be seen with this seedling out of 'Dark Passion' and 'Galactic Warrior.' The first picture is the first year out of a nursery bed,which has extra nutrients, some shade and is constantly weeded, and placed in a new garden bed with compost and a mixture of sand and clay. Every year this bed gets weeded once, maybe twice, if I can get to it, fertilized and lime placed in the Spring. Also, treated for iris borers and slugs, then sprayed with an anti-fungal. Picture 1: This is 06DPgw01 a tall bearded seedling at its fourth bloom season after move to a new bed. The seedlings are allowed to grow and bloom for three years after they are placed in a garden to allow them to mature, which gives me time to measure and evaluate them. This seedling, of the seven in this group had the most dramatic changes, and the rhizome and the bed aged. Not only did the ruffling increase the color change, for the seedling was dramatic when compared with the first photo taken of it. While this seedling's strengths have increased in that this photo was taken after a nasty storm, many would still have been upset thinking they were getting a purple iris and a near black iris bloomed for them. Picture 2: This is 06DPgw01 a tall bearded seedling at its fourth bloom season after move to new bed. The Internet is filled with photographs of irises with names attached to them that we know could not possibly be correct, but might in fact be correct. Depending on soil pH, nutrients and other factor “Dusky Challenger’ can go from what we all know it as a rick dark iris to one that is mauve in coloration. (2) If this happens to you, don’t get mad. Check your soil, compare your conditions to others that have the same flower that is blooming correctly. Better yet, give it some time to settle in. 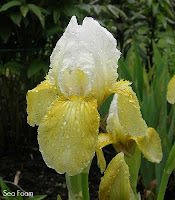 There are many irises that are not produced in your area, and that take time to acclimatize to your conditions. For now, enjoy the blooms and see what happens in the future. 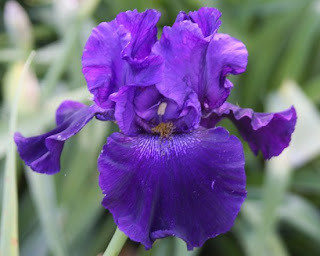 Miss Grace Sturtevant is now known as the First Lady of Irises for her early pioneering work with our favorite flower. 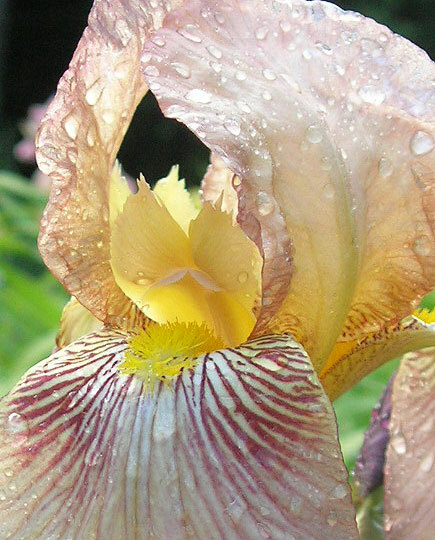 Before there was even an American Iris Society she was winning awards in horticultural shows for her beautiful creations. Sadly few of her varieties are left to us today. I've been collecting them for years and have only managed to find 20 of the over 200 she introduced. Her work with color was unparalleled for the day and she really advanced the palette that hybridizers would have to work with. Here are a few of my favorites. 'Anne Leslie' is a charming little amoena with ivory standards and rich red-violet falls. When it was introduced in 1918 it was quite the novel color combination. Listed as a TB in the 1939 Checklist, it rarely gets over 24" tall for me. Miss Sturtevant worked extensively with yellow toned irises, attempting to achieve deeper color tones, larger flowers and taller stalks. 'Chalice', from 1924, features deep golden yellow blossoms with all parts f the flower the same rich self color tone. The flowers have a wonderful flaring form quite unlike the dog-eared form seen on so many of the day, and the amazing candelabra branching allows multiple flowers to be open at once. A vigorous grower and a prolific bloomer makes this one an outstanding garden plant all around. 'Mother Of Pearl' is simply sublime. 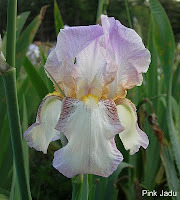 It is a large flower on tall stems in a shimmering frosty lilac tone, with cream colored hafts and a soft yellow beard. It grows and blooms well, and was quite well received when it debuted in 1917. One of the earliest pink plicatas to be brought to market was 'Pink Jadu', an introduction from 1931. It is a clean white iris with the petals edged and penciled in rose pink. It is lightly ruffled and was quite an advance for its time. Blue toned irises were a main area of work for many early hybridizers, as they attempted to breed for the truest blue possible. 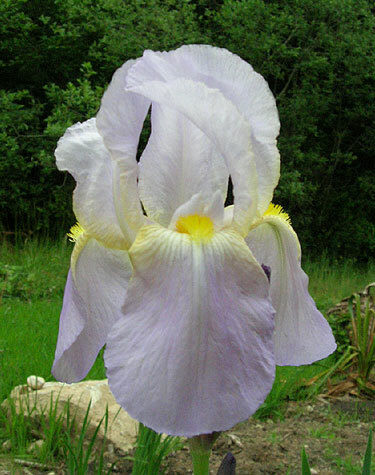 'Queen Caterina', tho described as a pale lavender-violet, was renowned for its wonderful clear color tone set off by bronze veining at the hafts and a bright golden beard. From 1918, it has a fine form with large flowers, wide petals, and excellent growth habits. It reliably blooms for me every year. Long before Jean Stevens took the iris world by storm in 1945 with her fabulous yellow amoena 'Pinnacle', Miss Sturtevant had created 'Sea Foam', an early blooming intermediate bearded variety from 1928 with crystalline white standards over primrose yellow falls. Not the best form to the flowers but so very different in color than anything else before it. 'Vishnu', an introduction from 1920, was described as being a light pinkish-cinnamon with maroon veining. A golden heart lights up the entire flower. It is a very distinct variety, with tall stalks, large flowers and a great garden presence. It is vigorous, hardy and has loads of personality and charm. This is but small peek into the legacy this amazing woman has left the iris world. You can read more about the life and work of Miss Sturtevant at the HIPS website. May is iris season in most places, but not only bearded iris. 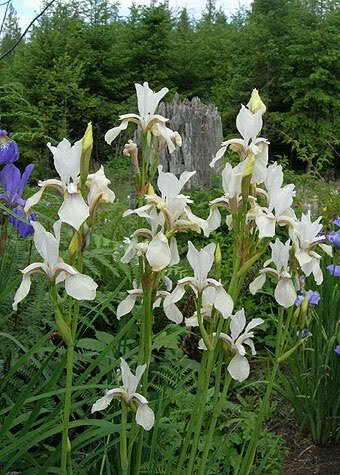 Although Iris shows abound and these have everything from Intermediate to Tall Bearded Irises and an array or aril and aril bred Irises, there's so much more if you seek out variety. 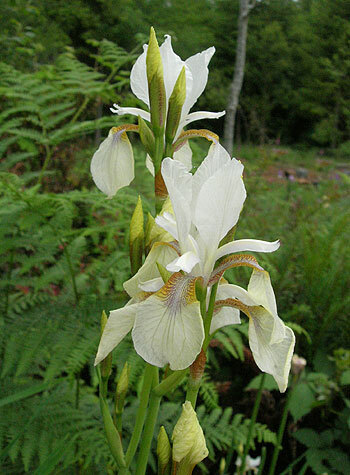 The first are a couple of the crested iris species. I suppose everyone knows the 'story' of the so-called "Japanese Roof" Iris, Iris tectorum. It is not from Japan and it doesn't grow on roofs. Of course. The species is native to China where it is known simply as "Iris". It is common, wide spread, tolerates a range of growing conditions and the Japanese long ago brought plants from China to Japan where it escaped and settled down. The story goes that in feudal Japan the Shogun and other powers mandated that only edible plants could be grown by the peasants. Although it is true that the ground rhizome of Iris tectorum is used to produce a fine quality of pale face powder, it is not true that women skirted the growing ban by cultivating this iris on Japanese thatch roofs to divert from the terrestrial restrictions. I imagine it CAN be grown in a thick thatch, but surely some wise ladies could find a spot in the corner of the rice fields or around a corner to stick a couple rhizomes of this lovely iris. What is true is that the first western botanists who 'discovered' this species fell hook line and sinker for this fairy tale.... and it does make a good story, one of those garden conversation starters. The nice thing is that the iris is easy to grow, hardy and can be very floriferous when happy. The typical blue-violet color is remarkably consistent although a few named variants have been introduced over the years. The biggest variation is the nearly pure white 'Alba' form. Unlike many 'albas' it is equally vigorous and hardy. An added bonus is that it is easy from seed and the white form comes true. The SIGNA seed exchange almost always has seed available. Although there really are varieties with variegated foliage, there are no named cultivars. A few different variegated patterns have been reported and at least one is occasionally offered for sale. It has white stripes in the foliage in early spring, but as summer approaches the variegation fades. It is a weak grower and poor bloomer compared to typical forms. Iris tectorum is suited to all but the very coldest or hottest and driest gardens. It makes a good non-bearded specimen for the May Iris shows. 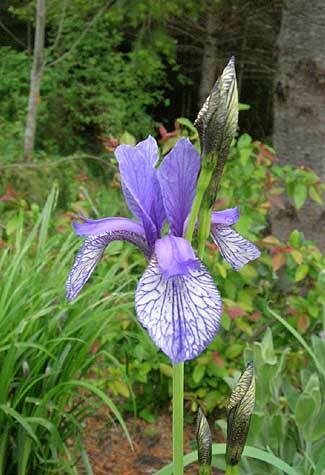 Quite comparable in many ways to this Asian beauty is the American native, Iris cristata , the Crested Iris. This species is native to a large part of the Central United States where it grows in thin soils in woodlands. It can form large mats of leaves dotted with flowers ranging from white, to blue to violet. Most gardeners find it fairly easy to grow in light shade and woodland soils. The flowers are born on short 'stems' rarely more than six inches except in a cultivar such as 'Powder Blue Giant' which, as you might suppose is taller. There are more than a dozen named cultivars including all the color range plus those with double flowers. Its small size and ultra floriferous nature make it perfect for the woodland rock garden. Iris cristata is a near perfect educational 'point' for iris shows. It is so much tinier than most other entries, it has a distinct form and it is native to the United States. If your show has an "Artisitic Design' Section for small arrangements this species has a very high 'cute quotient' and is tailor made for that. Even smaller and a bit trickier to grow is the Lake Iris, Iris lacustris, found around the Great Lakes of the United States in gravel and sandy spots under shoreline cedars. Like its relative the crested iris, it occurs in shades of blue, violet and white although the latter is quite rare. The whole species is rare and it is protected in many parts of its range. The Lake Iris grows in similar situations to the Crested Iris, but may be even hardier. 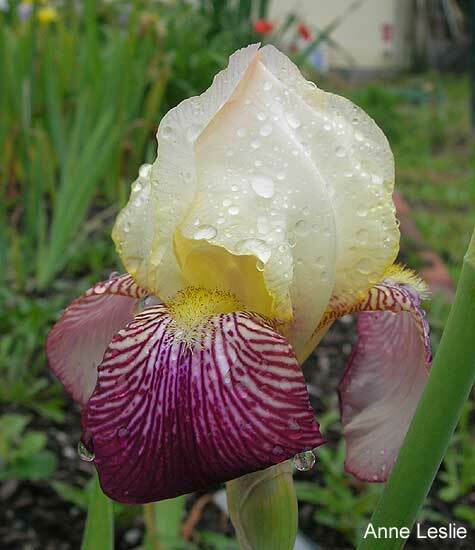 As a cut flower in the Iris show it may bewilder many of the viewers. The gardener just has to keep track of it so it doesn't get over grown by more aggressive companions in the garden. Of course the rarest of the rare are the historical reports of pink flowered Crested and Lake Irises. Both have been rumored, but neither plants nor pictures exist. We can only dream. Meanwhile these medium, small and smallest crested iris are perfect garden and show conversations starters. And if all you grow is bearded irises of all sorts, you need to expand your growing horizons into these woodland wonders. Someone once said that you have to grow a thousand irises to get one worthy of introduction --- and that may be true. And after you’ve dug, amended, fertilized, weeded, made the crosses, harvested and planted the seeds, waited a year or two for first bloom, then 3 or 4 years for evaluation (spraying and weeding all the while), finally, it stands before you -- the epitome of beauty (remembering, of course, that beauty is in the eye of the beholder), a flower worthy of introduction -- well, at least, of registration. THIS HAS BEEN THE EASY PART. Now comes the really hard part: NAMING IT. You are up against 64,000 competitors. That’s the approximate number of named irises as of today. Your challenge is to find a name that hasn’t been taken already. This used to mean combing through the printed iris registers since 1939. For a while, it seemed that all of the great names had been taken by the 1950s. Now, thanks to John I. Jones and others who toiled on it without recompense, we have the online iris register, where we can learn that the name we want to put on our iris was taken by someone else just 2 years ago! Aarrgh! The trick, of course, is to find a name so distinctive that no one else has thought of it, like, for instance, ‘Dolly Varden’, a colorful species of trout. Who else would think of naming an iris after a fish, eh? Sorry, the name was taken in 1929! Ah, well, we’ll get really specific. Here’s an SDB seedling with flame-red falls topped by glowing yellow standards. Honoring its hybridizer’s roots in Indiana, we’ll call it ‘Hoosier Hot Shots’, after the zany Hoosier band of the 1940s that featured washboards, kettles and God knows what else among its instruments. Passes the Iris Register in a breeze. Nobody remembers that, huh? Oops -- the U.S. Copyright Office does! Scratch that! We settle for ‘Hotspur’. (Thanks, Will Shakespeare (pre-Copyright Office!)) For similar reasons, forget ‘Hedy Lamarr’. The down side of referees, of course, is that their calls are final. When you register an iris, you list your first choice of names and your second choice. The Registrar will decide which name goes on your iris. A fatal error is assuming that your first choice will be selected, and, because of that, putting down just any old name as your second choice. Thus, your new, breakthrough red seedling, instead of being named ‘Scarlet Letter’, debuts as ‘Maggie’s Drawers’! Aarrgh! In fact, our Registrars go to great lengths to accommodate us, while guarding the integrity of the register. When I first submitted ‘Alleluia’, so named because of its Lenten colors and blooming at Eastertide, Keith responded that it was too close to ‘Hallelujah’, a name already taken. I argued that it was spelled differently and pronounced differently. In the end, Keith accepted the reasoning and my seedling was registered and introduced as ‘Alleluia’. 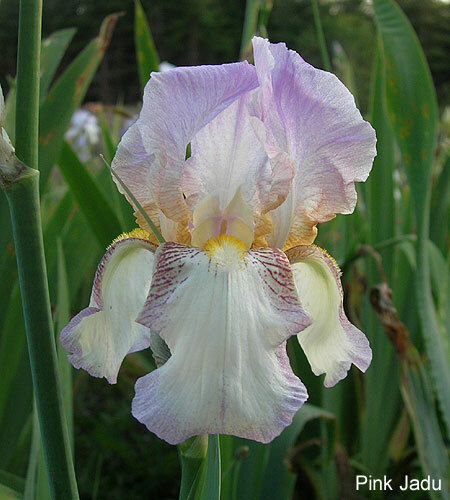 I hope everyone has had a chance to see the great article in the latest issue of Irises on Siberian Irises, written by Marty Schafer. I am loving the color trends coming in from these great hybridizers. I can't wait to grow some in my own garden. This beautiful white is a very old variety known as 'Snow Prince'. It was never officially registered as such and another iris bears that name now. Its chartreuse buds open to reveal small and delicate flowers of creamy white with a slight purple flush in the throat, and amber and cordovan veining on the hafts. The petals are translucent and the sunlight streams right thru, lighting them up like crystals. 'Snow Prince' tends to clump tightly and stems from the center grow taller than those on the edges so in full bloom it appears to be a bubbling fountain. It is a small plant as well, rarely getting taller than 30" for me. 'Flight Of Butterflies' is a masterpiece of a flower. A creation of Jean Witt, it was registered in 1972. A more apt name for this variety could not have been found. The small flowers have standards of bright blue-violet over falls that are white heavily veined in bright purple, and most reminiscent of a butterfly's wing. Even its buds are beautifully veined. A clump in full bloom makes a stunning show in the perennial border. The stems are loaded with buds and it has a long bloom time, making even more enjoyable. The foliage is narrow and very grass-like, which makes it useful even when not in bloom. Last, but never least, is I. chrysographes, a wonderful species siberian from China. The one in my garden is from seed wild-collected and grown by Dan Hinkley at Heronswood, years ago. Garden named by him as 'Kiwi Black' this luscious velvety black flower features long narrow petals, with wispy standards over dog-eared falls that are lightly waved and only slightly flared. What an effect a mature clump gives in full bloom! It is a favorite of visitors to my display garden. I do hope that there is room in the iris world for all types of flower forms and that varieties with delicate and evanescent traits and perhaps a more 'spidery' aspect can be appreciated and bred for. In my own planned crosses I'm imagining a flat form siberian with the dark black of I. chrysographes and long narrow petals floating prolifically over narrow grassy foliage. They would be a wonderful contrast to our new big beautiful show-offs. Look for opportunities in your garden to go against the grain and use these beautiful delicate siberians to their best advantage. Interesting flowers on their own, they can add a delicate texture and festive note to your flower garden that the large showy moderns lack. I promise, you'll be thrilled, too. Note: Blogger had some major technical issues this past week and the post by AIS editor Kelly Norris was lost. We hope he will be able to recreate it. Hopefully by now most of you have received your April issue of Irises with my apologies for its tardiness. I'm always eager to hear what you have to feed forward (the term feedback after all doesn't really imply a progressive, improvement-bound direction now does it?) Drop me a line at editor@irises.org. Photographs should be a minimum of 300 dpi (dots per inch) for standard printing. Check your camera owner's manual for instructions on how to adjust the resolution of images captured with your camera. Higher resolution images do take up more storage space, but essentially contain greater amounts of digital information that can be exploited in layouts and ultimately by printing presses to result in a magazine-quality look. Many digital cameras come pre-set to capture images at low resolutions of 96 or 150 dpi, which are more appropriate for on-screen viewing. These lower quality images are difficult to manipulate for publication design purposes. Watch the backgrounds! This is especially difficult at conventions when gardens are often crammed full of iris lovers all keen on indulging in the latest introduction. Take care to keep hands, feet, hats, and other obstructing body parts and accompaniments out of the backgrounds of your photos. Nobody wants to be distracted while perceiving the beauty of an iris flower. Too little editing is much better than too much editing. While Photoshop and various other digital photography software are readily available, save yourself the time by submitting your images directly to us. If you're an advanced photographer or software user, we'll make an exception. Otherwise, it's easier for us to take a great, well-composed photo and manipulate it accordingly for our layouts. If all else fails, drop me a line! I'll happily answer any and all questions about submissions to the magazine. I'm passionate about transforming our organization, its publication, and inspiring our readers to love irises. Stop the presses (err..keys!)..... news has reached the editor's desk from abroad that Keith Keppel's 2008 introduction 'Silk Road' took first place in Florence, Italy at the International Iris Competition. Congratulations to Keith and all the other American winners. 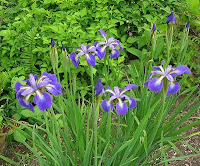 Irises with a flat form are common in some of the beardless species and have occasionally appeared in bearded iris seedling beds over the years, as well. 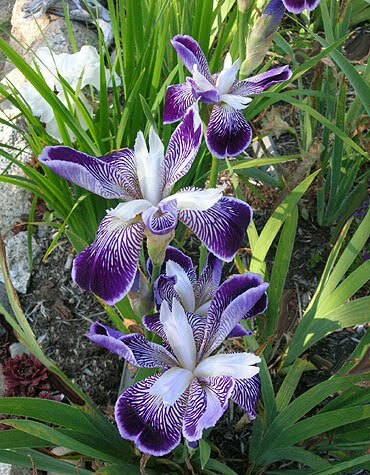 Altho they've never been very popular with the gardening public, nor with iris aficionados, several have been introduced over the years for their novelty value and individual beauty. 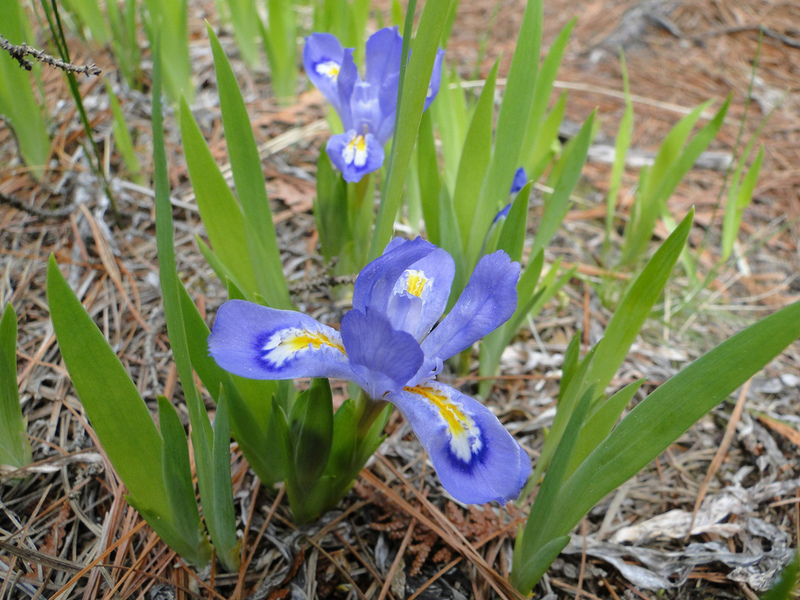 Recently, flat formed Siberian irises have made an appearance, mainly thru the work of hybridizers in Japan looking to mimic the form of that nation's namesake iris. Here are a few I grow and love. Click the photos to embiggen. I grow mainly historic irises, so most of my flatties are of the old diploid varieties. The oldest variety is 'Clematis', Arthur Bliss' lovely creation from 1917. 'Clematis' does not always show it's flat form. Buds opening during cool weather open to normal iris blooms, as the one in the background of this pic shows. Buds opening in warm weather magically open wide into a lovely imitation of a clematis bloom. For some reason warm weather causes the pattern, color and habit of the falls to be splashed almost entirely over the petals of the standards, causing them to look and act like the falls. Vigorous growth and loads of buds makes this a stand out iris. 'Japanesque' is similar in that the standards, like the falls, are heavily marked in a broken color pattern, so the flowers tend to be a little messier than 'Clematis'. A creation of Bertrand Farr from 1922, it is a riotous melody of white, lavender and deep velvety purple. It often opens multiple blooms at once along the stalks and a clump makes an impressive show. It adds a very fun and lively note to the iris garden. You'd never know to look at it, but 'Rhythm' is actually from 1950. Its very old fashioned form and pattern is due to one of its parents being from two 1920's varieties. 'Rhythm' is a true flattie in that it has six full falls and no standards. Each petal has a full beard and it lays perfectly flat. The blooms are a remarkably beautiful blend of golds and purples heavily veined in white, and have a lovely flare to them. The last two flatties I have to show you are Siberians. 'Helicopter' (Shidara, by Ben Hager I.1988) and 'Parasol' (Shidara, I.1997). I do not know much about these irises, other than they are both gorgeous flowers featuring six falls. 'Parasol' is a medium orchid tone with bright gold signals, while 'Helicopter' is a deep blue violet with white signals. Both make airy open clumps with numerous blooms floating on graceful 30" stalks. They have received much comment from visitors. I think this is a form of Siberian that is wide open for further development and improvement. I'm growing several dozen seedlings from them which I look forward to seeing in the coming years. I hope you've enjoyed this peek into a few irises that you may not have been familiar with before. 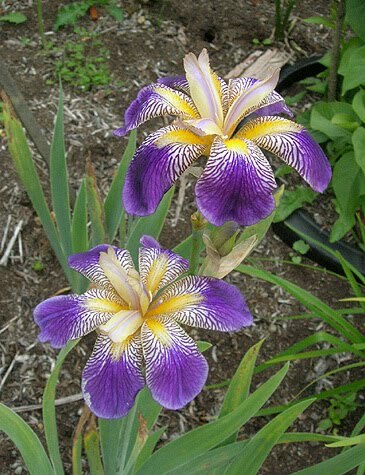 If you enjoy the novelty of this untraditional form consider adding some flatties to your iris collection or flower garden. 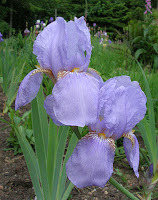 And if you enjoy historic irises please check out the new eZine I am publishing for hips-roots.com. Issue #1 is out now and free for the downloading on our website. Dr. John K. Small of the New York Botanical Garden was a major figure in the recognition of Louisiana irises. In the late 1920s and 1930s, Small studied native irises in Louisiana and Florida, named over forty species (all rescinded but one) and created a horticultural sensation by publishing gorgeous color plates in the Garden’s journal Addisonia. Decades of development obliterated the stands of Louisiana iris in the City. New Orleans steadily filled the land and paved the spaces between Lake Pontchartrain and the River, probably an ill-advised step as hindsight attests. Once much of the City must have looked as it did in 1867 when Theodore Lilienthal photographed irises. 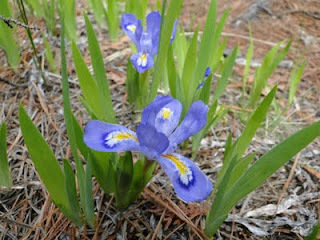 Now, wild irises can be found only on the periphery, although their predecessors’ genes live on in today’s hybrids. 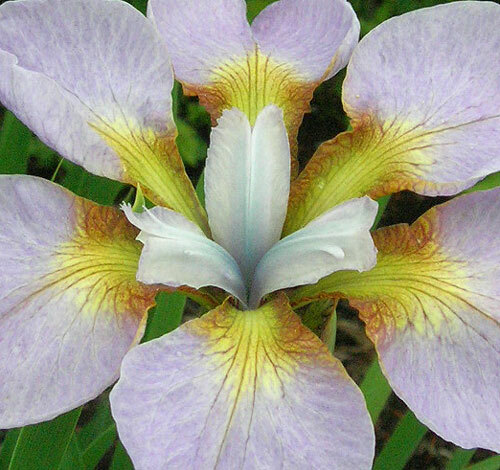 At the turn of the twenty-first century, no one would have designated New Orleans as a hotbed of iris interest. 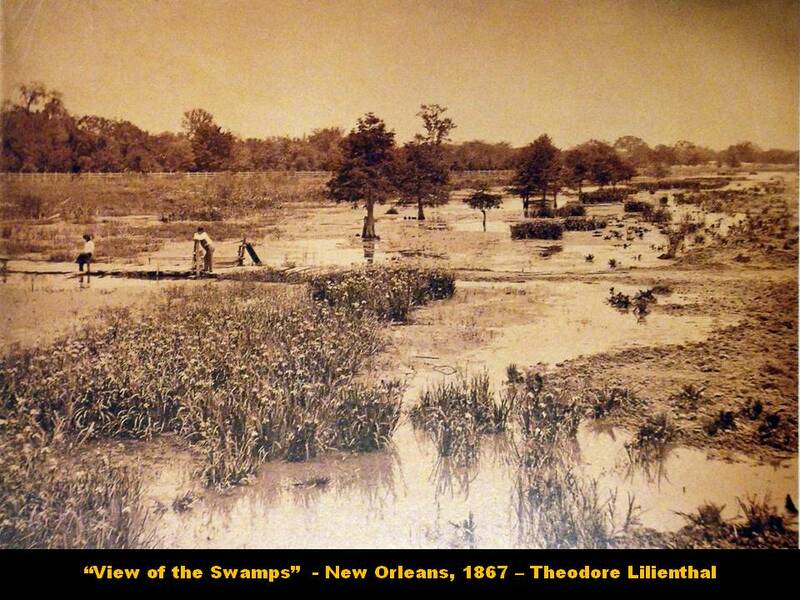 To be sure, as everywhere in the country, there was a steadily growing recognition of modern Louisiana hybrids. Gardeners increasingly grew them, and Louisianas maintained a presence in public gardens over the years, even if they waxed and waned somewhat with changes in the focus of those in charge. 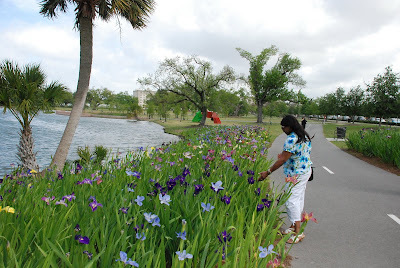 Since Hurricane Katrina, however, there has been a remarkable surge in interest in Louisiana irises in New Orleans. The storm devastated the City’s public gardens and parks. The lingering brackish water left most an ugly brown and facing major restoration efforts. Suddenly, the appeal of native irises exploded. There was, in fact, a perfect storm of demand and supply, as those working to restore gardens were met by growers in Mooringsport, Schriever, Denham Springs, Slidell and New Orleans willing to donate Louisiana irises by the thousands. Today, over five years after Hurricane Katrina, it would be a challenge to name a place where more Louisiana irises can be seen. There are major new plantings in the largest public gardens, and in the past year the irises have been introduced into local parks. As the following suggests, the iris future is bright. Longue Vue House and Garden consists of a classical revival mansion surrounded by an eight acre garden created by New Orleans civic activists and philanthropists Edith and Edgar Stern. The garden development dates from 1934 with a design by Ellen Biddle Shipman, the dean of American women landscape architects. 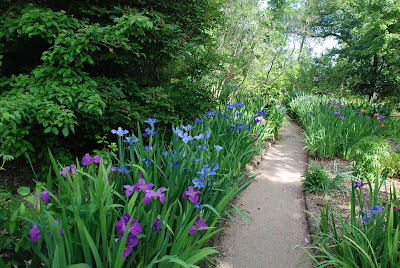 Divided into garden rooms, the Wild Garden is the site of a winding, hundred-yard "Iris Walk" that displays a newly updated collection of named Louisiana irises. 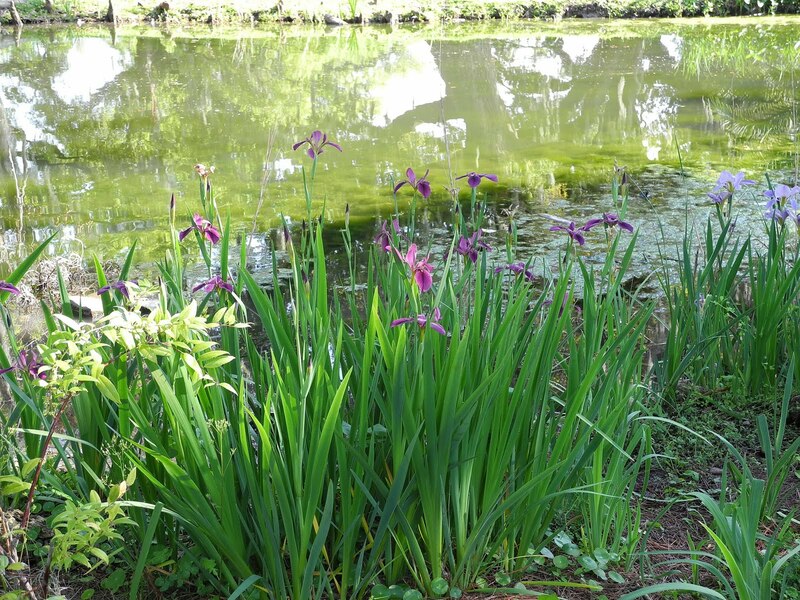 The original iris planting was established by Caroline Dormon, a prolific writer, multimedia artist, botanist, forester and conservationist, but few irises at Longue Vue today can be traced back to that era. The updated collection includes not only newer registered hybrids, but probably the most extensive collection of species forms in one location in the country, donated by Benny Trahan of Slidell. 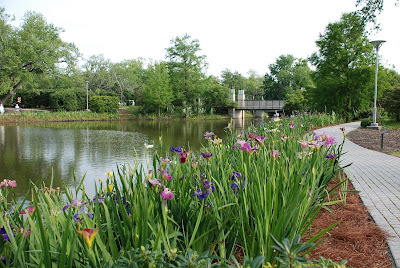 Louisiana irises are found in various spots in New Orleans’ 1300-acre City Park, but are concentrated in the New Orleans Botanical Garden, the New Orleans Museum of Art’s Sydney and Walda Besthoff Sculpture Garden, and the plantings along Big Lake near the Museum. The irises are scattered among the diverse plantings in the 12-acre Botanical Garden. Many clusters are old and unlabeled but new cultivars have been added. As part of the Garden’s highly varied and beautifully maintained plantings, the irises do not jump out like they do elsewhere. They provide a view that may be more typical of a home landscape and suggestive of how they can be incorporated into the visitor’s garden. The five acre Sculpture Garden was opened in November 2003 and was designed to display a permanent collection of over 50 sculptures by twentieth- and twenty-first century American, European, Latin American, Israeli and Japanese artists. The lagoon in the garden, part of an extensive system that meanders throughout City Park, was originally landscaped with I. pseudacorous. 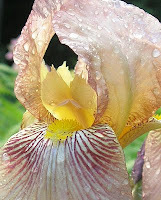 Katrina virtually destroyed them, one of its few positive contributions, and paved the way for the irises rightfully entitled to grace a beautiful New Orleans garden. Big Lake is also a part of the City Park lagoon system. In the last several years, the periphery was developed with paved walking areas and other features. 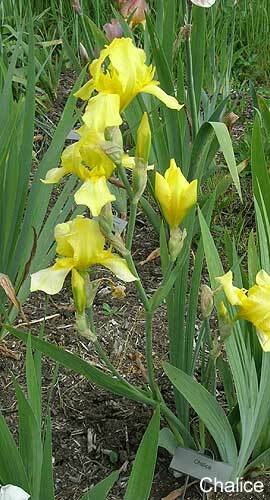 Large swaths of Louisiana irises are now massed near the edges in several spots. In bloom, they cannot be ignored. The watery edges of the City Park lagoons are visually the perfect spot to display Louisiana irises. Sadly, the lagoons are connected to the brackish Lake Pontchartrain. When a storm surge pushes in from the Lake, the rise in salinity can damage the irises. After Katrina, a freshwater pump was installed to ameliorate the salty water, but time will tell if Louisianas can grow in a spot that looks like home but may not taste the same. Many have survived so far. 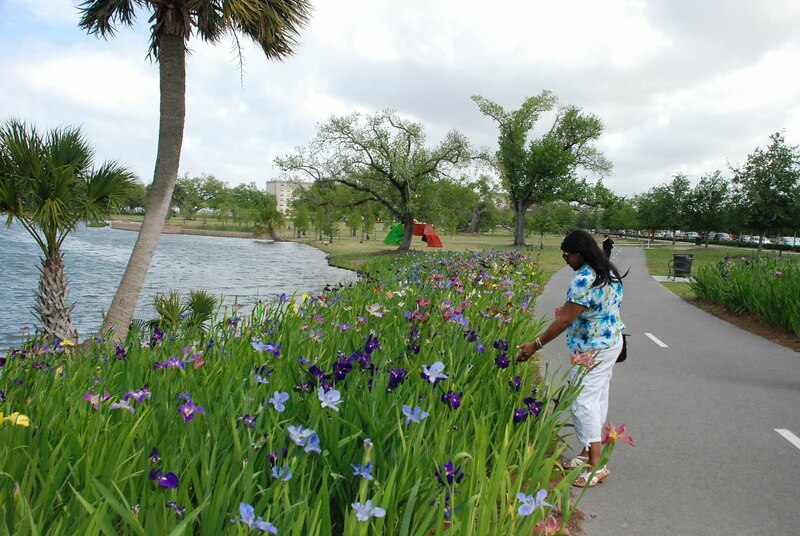 Beyond New Orleans’ major public gardens, Louisiana iris plantings have been completed at Heritage Park in Slidell, Joe Brown Park in New Orleans East, and Brechtel Park on the West Bank. The Town of Jean Lafitte about twenty miles South has a number of places to see Louisiana irises, but the main show there is a boardwalk out into the swamp among the native stands of I. giganticaerulea, growing like they used to throughout the area. New Orleans may not be the Iris Center of the Universe, but with the developments of the last five years, it is in the hunt.